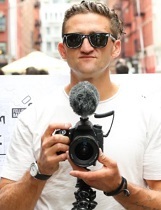 Neistat attained commercial success with the HBO series The Neistat Brothers and indie film Daddy Longlegs. With ten years of experience in creating TV commercials, Neistat took his story-telling ability and married it with his commercial experience to re-define branded content on the internet with companies such as Mercedes and Nike. Most recently, Neistat’s technology company, Beme, was acquired by CNN. Now, Neistat & CNN are building out a new digital network together with Neistat at the helm. Beyond his ever popular YouTube channel, his audience has followed him to Instagram, Twitter, and SnapChat to hear his honest narrative and get a glimpse into the creator lifestyle. Casey has set a new standard for the way brands interact with digital creators and carved out a niche for himself as a well-respected filmmaker, technology developer, and digital native influencer.